The main objective of this integrated research program is to explore the acceptance and the feasibility of the implementation of the concept of dynamic consent (DC) for the purpose of translational research in the “real life” context of CARPEM. Almost of the teams will be implicated in this integrated program, divided in 5 workpackages (WPs). This innovative approach is the second step of the translational ethics research program dedicated to promote partnering with patients for cancer research in France, initiated along the previous CARPEM’s period. Extending the engagement of CARPEM in health democracy and translational ethics, this integrated program 3 will be coordinated by team 15 (Ethics laboratory) and integrate an ethical expertise in CARPEM governance. Patients and patients’ representatives will have a major role in the entire process. We assume that this integrated research program will reinforce the integration of patients in CARPEM governance and fuel the debate about ethical issues encountered in real-life practice and hence highlight the need for a pragmatic conception of translational ethics. One of the great specificity of CARPEM is its expertise in translational research and precision medicine in the field of cancer. In this context, the way that cancer research is carried out has profoundly changed. Nowadays research crucially depends upon infrastructures such as biobanks, data repositories, where health care data and biological samples can be reused for the purpose of different ex-vivo non-interventional phases of translational research. The duration of the storage should ideally be unlimited, and sharing data and samples at a local, national or international level are essential for progress in the area. In the case of CARPEM project, which relies on a research consortium, translational platforms, and international cooperation, it is difficult if not impossible, to obtain ethically valuable informed consent for all future research at the time of recruitment, and before the beginning of each research project. Re-consenting is both time-consuming and costly, whereas researchers need to be able to react quickly and to have flexibility in their research. Moreover, it exposes to the risk of high dropout rates with regard to the difficulties in locating people after their first inclusion. Thus, on one hand, the cancer research community is all at once tempted and encouraged to share and reuse biological samples and health data in order to promote scientific discovery and to enhance research reproducibility. On the other hand, health care professionals and researchers encounter social and legal barriers that threaten their research projects. These facts have opened the way to the so-called “dynamic consent” (DC). DC is a new ethical concept that offers a new approach to consent, designed to meet the needs of current research practices and the preferences of the participants (Kaye 2014 Eur J HumGenet; Budin-Ljosne 2017, BMC Med Ethics). It was initially developed in the field of biobanking and was conceived as a personalized and digital communication interface between researchers, patients, and citizen, placing patients at the center of the decision process. More than that, DC constitutes a new approach to allow a two-way communication to favor the creation of a more engaged patient community, where subjects can easily tailor their own consent preferences. DC offers flexibility and allows participants to modify their consent preferences over time. Thus, the characteristics of DC seem to meet all the criteria for both the needs of researchers and the expectations of patients. The use of digital technological interactive interface can be customized to favor multiple interactions, including the implementation of self-reported data by patients. Moreover, it fits with the requirements of the European General Data Protection Regulation of 2016, and thus favors the international collaborations. Finally, new technological information tools allow not only data mining and analysis but also the integration of data from multiple sources. Linking information about the same individuals from different data sources (administrative, healthcare pathway, environmental, self-reported, or self-produced by connected objects) can be extremely useful, the knowledge gained being considered as dependent on both the quantity and the quality of the shared data. Thus, data linkage, which can integrate pieces of informations that would otherwise be missing is also subject of informed consent. Linking information about the same individuals from different data sources can assist in establishing new relationships between health and environment, lifestyle and other risk factors (see §IRP1-WP1). Nevertheless, such linking practices expose individuals to several risks including the vulaneration of privacy. A few studies have collected opinions about data linkage for the purpose of health research. However, to the best of our knowledge, none of these studies involved French participants. A recent systematic review of qualitative studies aiming to explore public responses to data sharing and linkage of health data for research purposes concludes that, even though public support for data sharing and linkage does exist, it remains conditional and a range of concerns exists (Aitken, BMC Med Ethics 2016). The PEARL study (Audrey, BMC Med Res Methodol 2016) reported also that the youth of participants in epidemiological research strongly influences the degree of acceptability of data linkage. Despite of their first engagement in an epidemiological research, many young participants feel strongly concerned by linkage practices, thus categorically refusing linkage of their personal data. Integrated research Program 3 meets the conditions to test the theoretical and real-life acceptance of such practices. Even though the need for a new specific bioethics approach is debated (Hostiuc Transl Med 2016, Wolf J Law Med Ethics 2015), biomedical research remains subject to informed consent and autonomy (Kagarise Arch Surg 2000). Informed consent is also the basis for Data and Privacy Law in France and the European General Data Protection Regulation. Albeit application of new information technologies allows a greater amount of data to be shared to large scale, the mechanism of informed consent remains static and paper based, hesitating between two main forms: large or specific ones. Thus, ethical norms and practices in the area of consent seem to have been fixed in the last century, meaning that they should be updated to address the ethical and legal issues around participation of patients to translational research. The obligation for researchers to obtain informed consent from potential participants before the beginning of any research project has remained a fundamental principle of medical research, enshrined in the Declaration of Helsinki. Nevertheless, despite the need for sharing human samples and data goes beyond national boarders, legal rules and ethical regulations are heavily different worldwide, sometimes incompatible with each other. This is particularly true for precision medicine as it is blurring the boundaries between the clinics, the laboratory, and the healthcare industry reinforcing the continuum between research and care practice and creating new regulatory spaces that have to be thought at an international level (Nicol J Law Biosci 2016). In France, health care professionals have the duty to individually inform the subjects before any storage, that their biological samples or healthcare data will be stored for research purpose, unless they opt out. Biological samples have to be registered in bio-collections that must be declared to the French ministry of research. After that the material can be used (or reused) for further research, according to complicated legal rules that are different whether the reused material consists in biological samples or in personal data, but also whether the study is prospective or retrospective. For health care data and other personal data, the French data protection act of January 6th 1978, modified in 2004 and in 2016, expects professionals to provide specific information to each concerned subject, before any reuse of their electronic health record data for the purpose of non-interventional studies. Thus, DC could provide the answer to some of patients and patient representatives’ expectations: Our CARPEM team highlighted that many patients are interested in knowing the fate of their samples and data. We also found that those who felt concerned about their personal samples or data were expecting health care professional to give them the opportunity to consent (or refuse) before any reuse or sharing (Mamzer J Transl Med 2017). Furthermore, DC could favor samples and data sharing for the purpose of cancer research within the consortium, as well as at a national and at the international level. 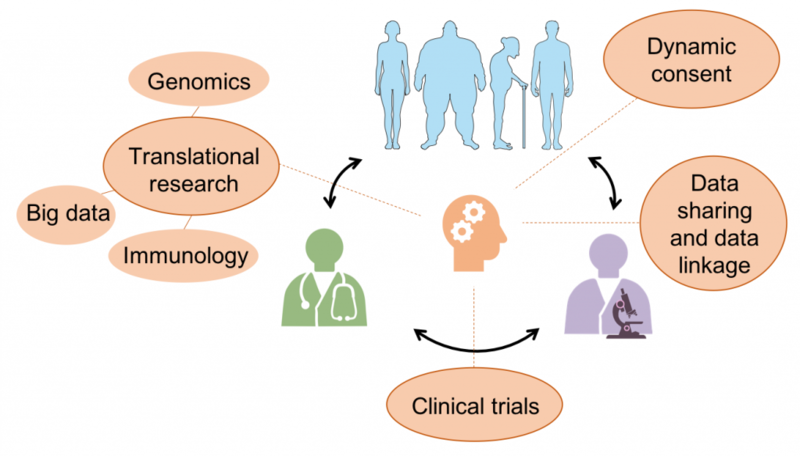 The CARPEM program offers a unique opportunity to test in “real-life” the acceptance, and the feasibility of the implementation of this concept of DC (dynamic consent) in the context of translational research devoted to the cancer in France. The integrated program of research 3 will contribute to the production of new knowledge concerning patients’ expectations and fears towards their participation to specific research cohort, but also concerning the sharing and the linkage of their data. It will also contribute to the production of a DC platform connected to the translational platform, thus offering the opportunity to patients to gather all their data at the same place. DC constitutes a major opportunity to contribute to the shaping to renewed ethical principles and procedures that will be compatible with modern genomic translational research and the advent of artificial intelligence. WP6 will rely on qualitative methodologies (to explore the interest of CARPEM patients in actively participating to translational research cohorts, their perception of the dynamic consent concept, the conditions of their acceptance of translational research practices such as sample and data sharing or data linkage, and their expectation for the communication of global data (personal data, secondary findings, etc…). It will also investigate the professionals’ fears and expectations for such an innovative concept (oncologists, geneticists, researchers, general practitioners). The WP 7 and 8 constitute the second phase of this integrated research program with an interventional research action devoted to the building of a DC platform linked with the translational platform and to test its operability, and its acceptance by patients and professionals. WP9 is devoted to test the acceptance of data linkage in real-life conditions exemplified by the link of the Nutrinet database to medical health records of CARPEM patients for research purposes. WP 10 is devoted to different actions of coordination and support; it will rely on Ethics and strongly implicate the Advisory Translational Ethics Board (ATEB), created during the first CARPEM period. This WP will coordinate and organize communication and debates with the public.